To calculate volume of a pyramid, formula is used to solve the problems on pyramid using step-by-step explanation. 1. The base of a right pyramid is a rectangle of length 12 meters and breadth 9 meters. If each of the slant edges of the pyramid is 8.5 meters, find the volume of the pyramid. Let the rectangle WXYZ be the base of the right pyramid and its diagonal WY and XZ intersect at O. If OP be perpendicular to the plane of the rectangle at O then OP is the height of the right pyramid. i.e., the height of the pyramid = 4 m.
= 1/3 × 12 × 9 × 4 cubic metre. Find the area of the area of the triangle XYZ and the volume of pyramid formed. And from ∆ OZX we get, ZX = √2 a (Since, OZ ┴ OX). Thus, XYZ is an equilateral triangle of side √2 a. Let Z be the vertex of the pyramid OXYZ; then the base of the pyramid is the triangle OXY. Again, OZis perpendicular to both OX and OY at their at their point of intersection O. Therefore, the height of the pyramid is OZ. 3. 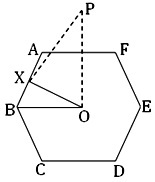 The base of a right pyramid is a regular hexagon whose area is 24√3 square cm. If the area of a side face the pyramid is 4√6 square cm what should be its volume? = (3√3/2) a² square cm. Let OP be perpendicular to the plane of the base of the pyramid at O, the centre of the hexagon; then OP is the slant height of the pyramid. Draw OX ┴ AB and join OB and PX. Hence, PX is the slant height of the pyramid. And BX = 1/2 ∙ AB = 2. = 1/3 × area of the base × OP. = 1/3 × 24√3 × 2√3 cubic cm.